Four-color process printed on Side 1 of 14pt C2S White Semi-Gloss stock. Coated with Aqueous Gloss. Diners can plan a fun-packed trip to Adventure Lodges of Georgia with this tri-panel restaurant table tent. Each side shows a different lodge feature, from dining to outdoor activities to GoPro rentals. Adventure Lodges' contact information and logo appear on every panel to make sure readers have an opportunity to get in touch with the lodge no matter where they're looking on the design. Four-color process printed on Side 1 of 14pt C2S White Semi-Gloss stock coated with Bio-Plus UV Flood Gloss. 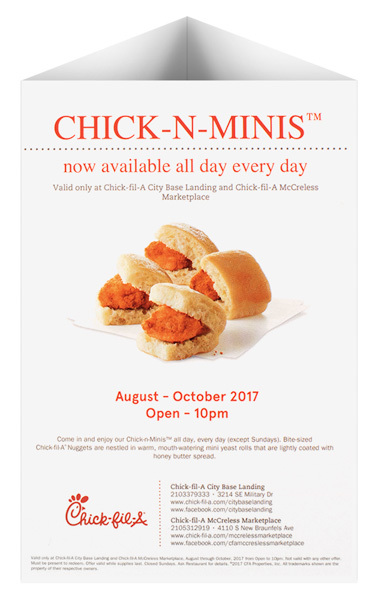 This table tent card from Chick-fil-A showcases an image of its tasty sandwiches against a clean white background. The red color of the text both matches the company's logo and helps put recipients in a hungry mood. Four-color process printed on Side 1 of 14pt C2S White Semi-Gloss stock. Coated with BioPlus UV. 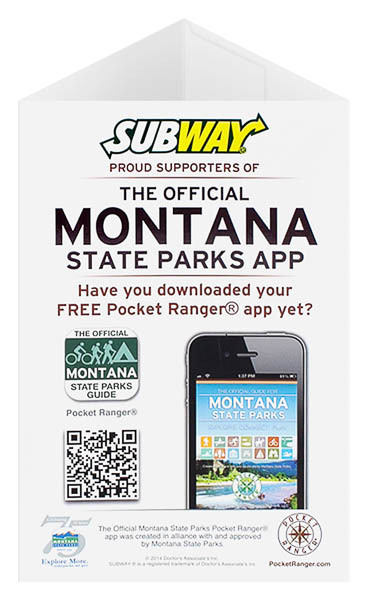 ParksByNature teamed up with Subway and the Montana State Parks to promote its free Pocket Ranger app, which encourages Montanans to get out and enjoy the gorgeous natural wonders in their state. An image of a phone shows what the app looks like, while a QR code lets readers download it. This table tent card features the same design on all three sides to send its message to anyone who might happen by. 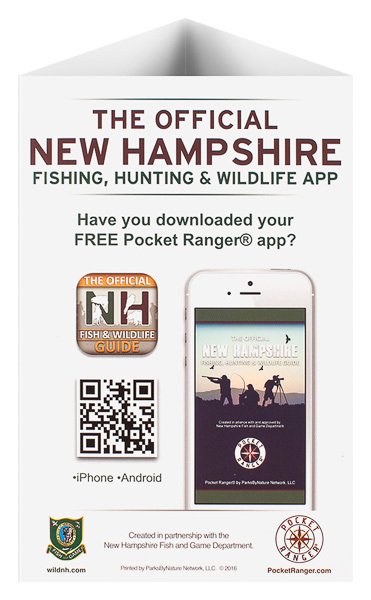 This tri-panel table tent card promotes the official New Hampshire Fishing, Hunting & Wildlife App. Each side displays the same design. 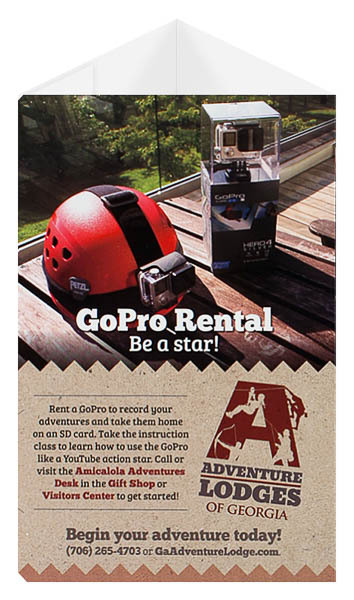 An image of a phone shows readers what the free app looks like, while a QR code can take the reader to the interactive outdoor guide. The tent also showcases the logos of the organizations who created the app. Earthy colors of brown and green tie into the outdoor theme. Two tabs on the side of this tri-panel product tuck into a flap that slides behind one panel, creating a self-supporting piece that stands upright on a table or counter. Imprint a different design on each 4" x 6" side—including information about products, upcoming promotions, or tradeshow events—to create an interactive experience for readers as they rotate it to view each panel. Its four-color process (CMYK) printing is well-suited to including high-resolution photos and other intricate designs. Dimension Closed: 4" x 6"
Dimension Open: 14 13/100" x 6"